Mining its past animated features for kids television programming is nothing new for Disney, as folks who grew up watching 101 Dalmatians: The Series, The Lion King's Timon & Pumbaa or TaleSpin will no doubt remember. (Just how did Baloo end up a pilot, King Louie a restauranteur and Shere Khan a wealthy businessman anyway?) Jake and the Never Land Pirates is the latest Disney TV cartoon series to find inspiration in the company's feature animation archives, setting its adventures in Peter Pan's Never Land and neighboring Pirate Island, the latter being the home of junior swashbucklers Jake, Izzy, Cubby (whose name is no doubt a nod to the original Mickey Mouse Club), Skully the parrot and their sentient ship Bucky. Though "the Pan" never makes an appearance in the series (at least, he doesn't in the show's first DVD release, "Yo Ho, Mateys Away"), his nemesis Captain Hook and Mr. Smee play integral roles in the show. 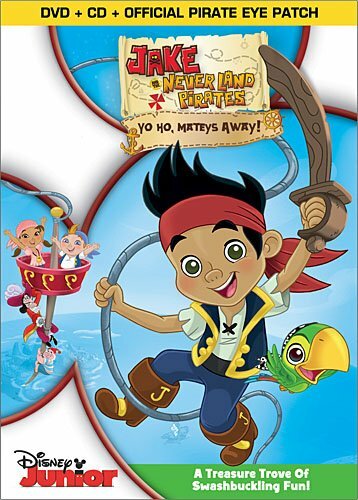 Jake and the Never Land Pirates is intended for preschool-aged viewers and attempts to teach early-life lessons about dealing with bullies, teamwork, counting and problem-solving. How effectively it does this, however, is undermined by some of the show's inherent traits. For the show, the character of Captain Hook has been transformed (much like the classic Disney characters have for another Disney Junior series, Mickey Mouse Clubhouse) to a much more inoffensive and harmless villain. Basically, he's just a stupid and greedy bully now. In just about every episode of Jake and the Never Land Pirates, Hook sees Jake and friends playing with something fun, whether it be a skateboard, guitar or boomerang, etc., decides he wants it for himself and steals it. The Never Land Pirates then manage to get it back by solving "pirate problems" that Hook is too dumb or selfish to figure out. The problem is, none of this really teaches kids anything about dealing with real-life bullies. In one episode, Hook loses his hat and Jake says they need to give it back to him because, even though he's always taking their stuff, it's his hat and should go back to him. Hook is so perplexed by this gesture that he assumes it must be a trick of some sort. The episode ends with Hook learning nothing about sharing, just as none of the other episodes teach anything real about what to do if a bully takes something of yours other than just "get it back." Izzy, the show's token girl pirate, carries a small bag of pixie dust that Tinkerbelle's fairy friends gave her "for emergencies only." As fate would have it, every episode ends with a "pirate problem" that gets solved by the kids using the pixie dust to fly away. How educational is that? Hey, kids! When you're getting picked on by a bully, the way to get out of the situation is to fly away using your magical pixie dust... because the bully won't have any... and you will... and you can say that the fairies gave it to you... for emergencies... Oh, nevermind. You're going to get the crap kicked out of you. Like many kids shows nowadays, each half-hour episode of Jake and the Never Land Pirates is broken into two 15-minute installments. The issue I have with this is that it makes to shows too fast-paced. This becomes a problem for Jake and the Never Land Pirates when it comes time to solve "pirate problems." The show never takes a breath long enough to give its young viewers a chance to think about the situation or its solution before one of the characters blurts out the answer and the action moves on. Early in each episode, Jake asks viewers to be on the lookout for gold doubloons after solving pirate problems. I assumed this was like asking kids to search for Blue's Clues paw-prints or the "Super Letters" in Super Why!, two other "interactive" preschooler shows, but in this instance kids are never even given an opportunity to point the golden prizes out to the characters on the show because the characters often point them out first, sometimes even announcing their presence before they're entirely visible on screen! Jake and friends then "grab 'em and go," moving quickly on to the next pirate problem as if they all had ADD. 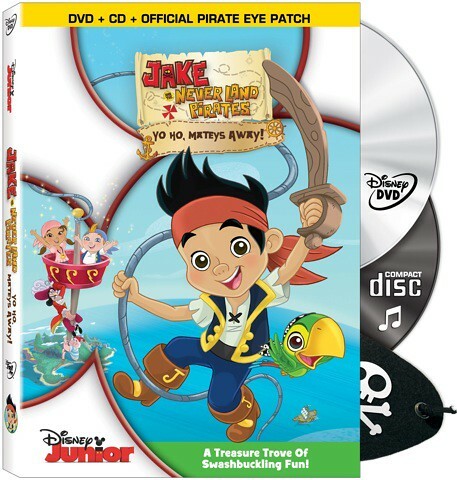 The show's first DVD release is entitled "Jake and the Never Land Pirates: Yo Ho, Mateys Away," a garbling of pirate lingo that baffles me more every time I think about it. Why are the mateys going away? Aren't "mateys" supposed to be friends? It sounds like they're being tossed overboard or something. Is it a typo and supposed to be "Ahoy" instead of "Away" and nobody caught it or bothered to fix it? 4. Off The Hook!/Never Say Never! 6. Happy Hook Day!/No Returns! Also included on the DVD are two bonus features: "Yo Ho, You Ready To Be A Never Land Pirate?" and "Pirate Party." The latter consists of merely the songs and videos from the closing credits of each episode on the DVD ("Hot Lava," "Aw, Coconuts," "Tick Tock Croc," "Never Land Pirate Band," "Pirate Password," "Talk Like A Pirate" and "Bucky's Shanty") with the lyrics displayed (via "Pirate-oke") so your kids can learn the words to these songs and sing them to you ad nauseam. The "Ready" feature informs viewers of what they'll need to be a pirate like the kids on the show; specifically how to dress like a pirate (it turns out all you need are boots, a jacket and a hat--pants are optional, I guess), how to talk like a pirate by quoting each character's catch-phrase (try using Cubby's "aw, coconuts" on next year's Talk Like A Pirate Day) and what pirate gear you'll need (including a sword and that ever-so-usefull bag of pixie dust). But that's not all! There's also a free pirate eye patch included as well as a music CD of the seven songs I previously mentioned. The songs are performed (as they are on the show) by two guys who call themselves Bones and Sharkey. They remind me of the kind of band you'd expect to see performing in the children's section of your local library on special occasions. Good for them for landing such a big-time gig, but I can assure you that CD will never be placed in any music-playing device I'll ever own. Now, I'm aware it does sound like I've been bashing this show quite a bit, but I've really just been nit-picking. It's not a bad show, but because it's intended for a preschool audience I may be taking a bit more of a critical eye to it. I showed the episodes on the DVD to my son, who has just started preschool, to get his take. He enjoyed the show and called it "funny," though I don't recall him ever laughing while watching it. He particularly enjoyed counting the gold doubloons out loud with Jake at the end of each episode. Ultimately though, he still prefers to watch and asks for Blue's Clues or Super Why!, two well-done, slow-paced and consistently, effectively educational shows. Even at his young age, he can tell quality, even though he can't yet analyze his feelings in a scathing review like his old man can. The show's premise shows a lot of promise but it's really the execution and writing that comes up a little lacking. Again, Jake and the Never Land Pirates isn't a bad show, though both my son and I agree that there are better and more effectively educational shows you could be watching with your preschooler. Of course there are also a lot worse shows out there too and if you're looking for something pretty harmless to have your kids watch, and they're at all into pirates or Disney cartoons, Jake and his crew are worth a look. After all, ultimately as the parent, you should be the one to decide whether to say "Yo Ho" to Jake and his crew or send those "Mateys Away." In 2030, I tell my kids about a the sixth season of How I Met Your Mother. Chemistry is indeed a vital part of this Big Bang. Unfortunately, with Futurama Volume 5, one must take the good with the bad. Your mention of TailSpin alone put me into whole trip down memory lane. This show looks great Sombrero, and great review !